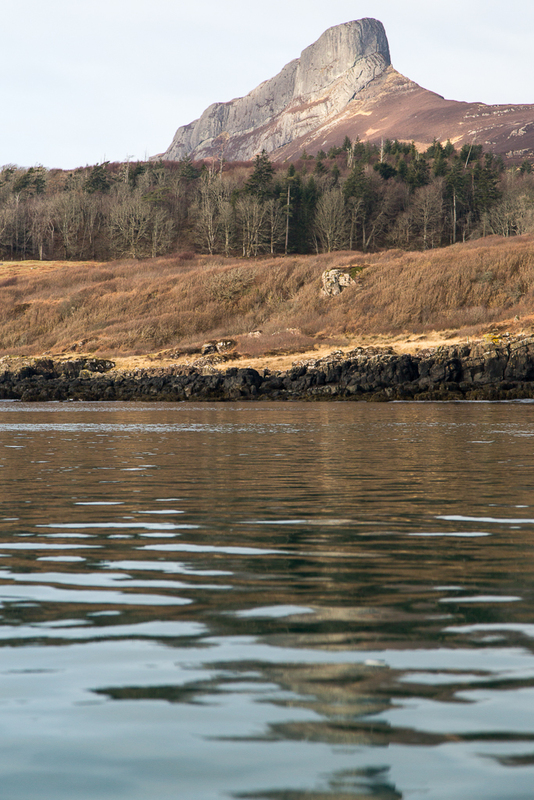 Smoke on the water, in the Sound of Eigg. 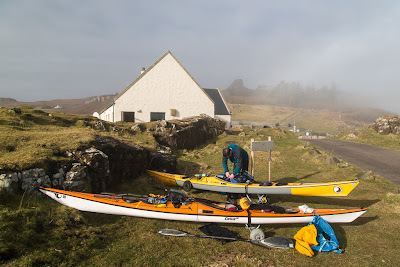 Ian and I found our kayaks had been untouched and were as we had left them at the Galmisdale shop and community centre. 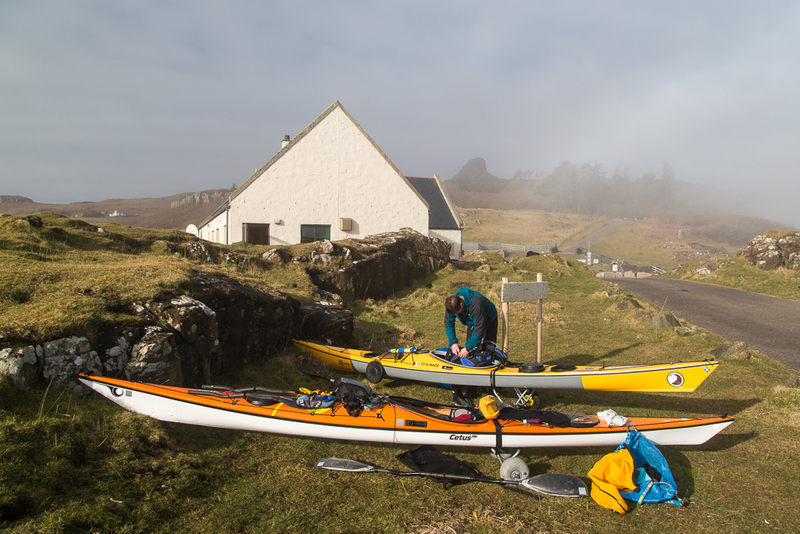 Facilities at the shop include a small restaurant, toilets, showers, wifi and a water tap. Our gear was rather damp so we let it dry in the sun as we moved the kayaks down the jett ready for our crossing to Muck, the last of the Small Isles.. 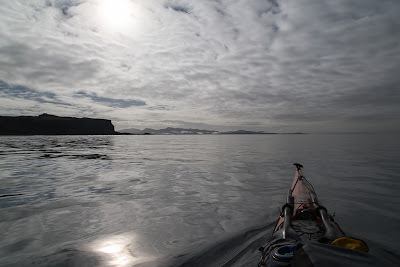 There was a sea of fog to the north east though we could see the dark hill above Mallaig and the Distant mountains of Knoydart soaring into the clear air above. 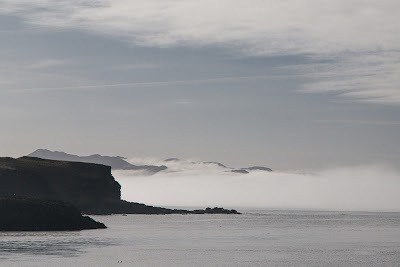 To the south west a similar bank of fog floated above the sea beyond Eilean Chathastail. 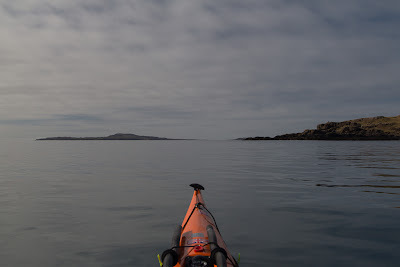 We could see the Ardnamurchan mountains but there was no sign of the great peninsula. 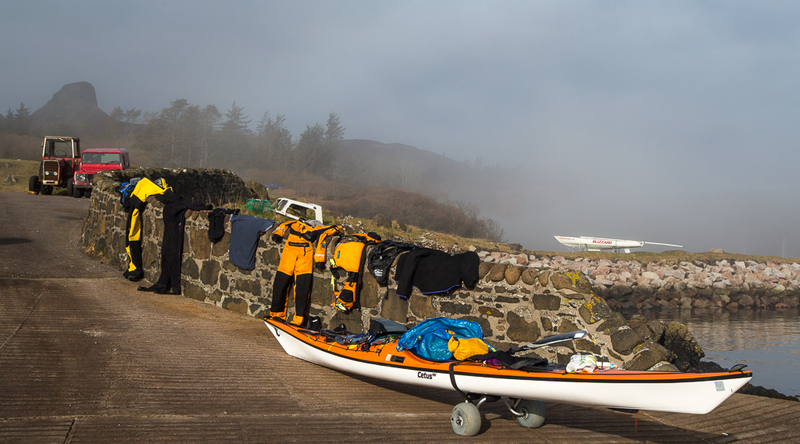 According to the West Coast Pilot we would meet 3 knot tides in mid channel and 4 knots off the coast of Muck. It was spring tides and we would be in mid channel 3 hours after slack. 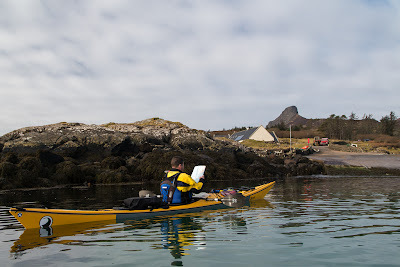 The tide was running through the gap between Eigg and Eilean Chathastail like a river so with a last look at the chart we prepared to put in some hard work with a high ferry angle. It was good to be on our way again and low lying Muck lay on the far side of a mirror calm Sound of Eigg. 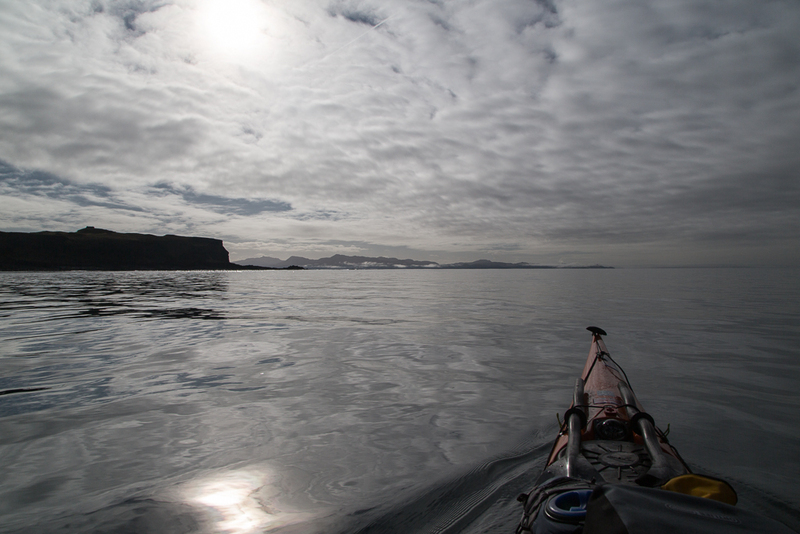 To our left the fog banks had lifted allowing us to see all the way to distant Ardnamurchan Point. 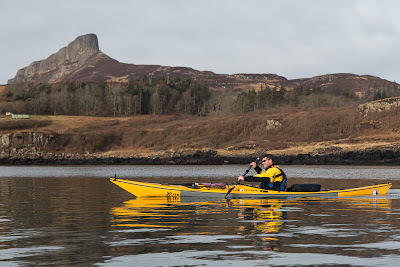 ...by a magnificent view of the Sgurr of Eigg, which we had been denied the day before. ...piece of coast with a dark secret. Beneath the Sgurr are some sea caves that were cut when the sea was higher. The big one is Cathedral cave. 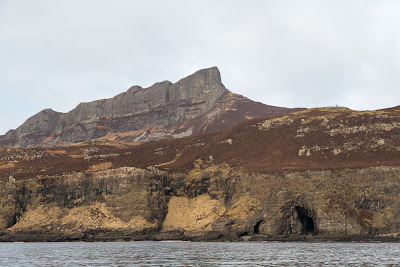 Nearby a smaller cave, Uamh Fhraing (also known as the Massacre Cave) saw the death of almost the entire population of the MacDonalds who inhabited Eigg. 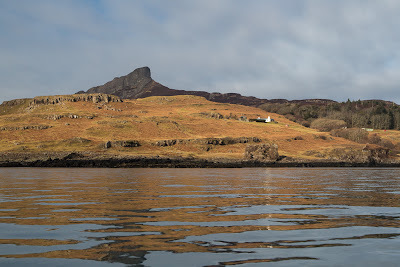 In 1577, 395 Macdonalds hid in the cave from a group of raiding McLeods from Skye.They were found and the McLeods lit a fire at the only entrance. They all died and the corpses were left in the cave to rot. As recently as 1979 a human skull was found in the cave. 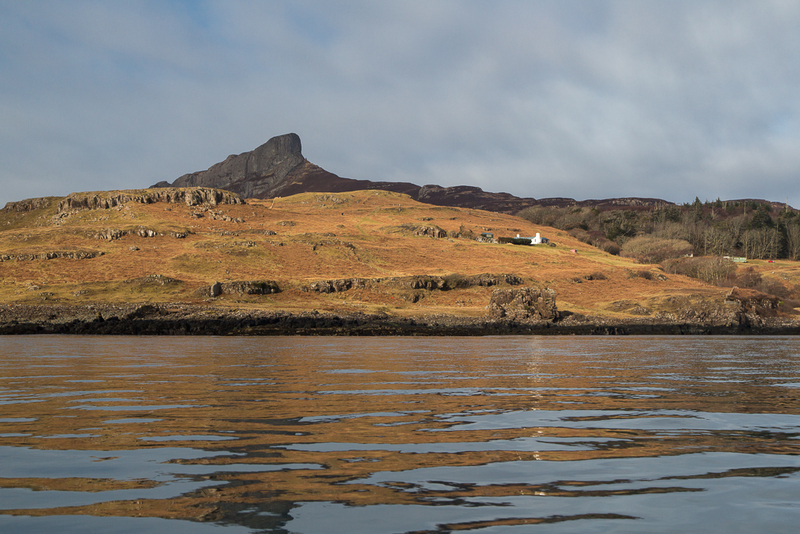 In those dark days in Eigg's past, it was not banks of fog on the water but smoke.